Chemistry – A European Journal 2017, 49, 11856–11865. First published online 9 Aug 2017. Despite various applications of alkylzinc carboxylates in chemistry and materials science, the corresponding organozinc derivatives of organophosphorus compounds still represent an insufficiently explored area. 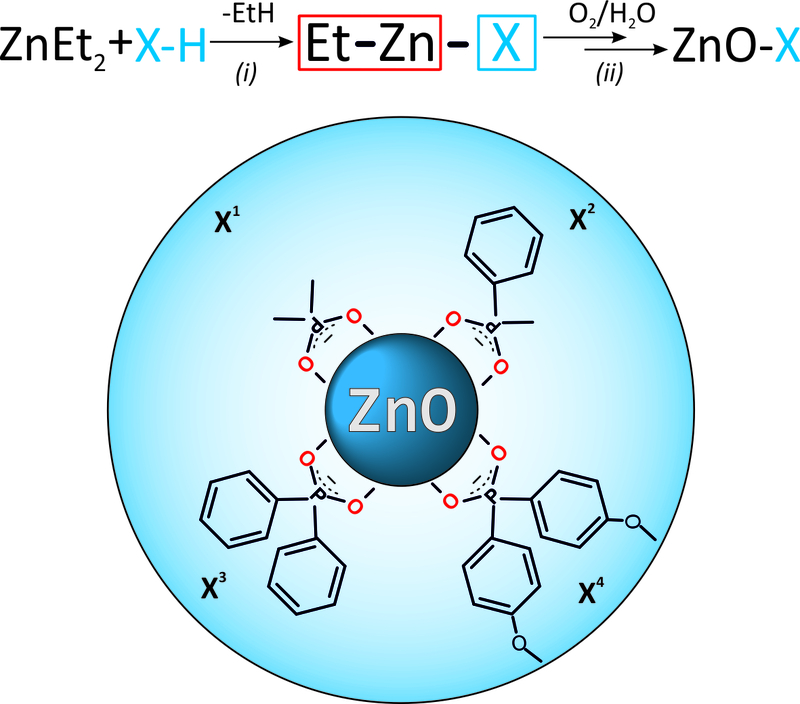 To fill this gap, we report on the synthesis of alkylzinc phosphinates and their use as efficient precursors of phosphinate-coated ZnO nanocrystals in the quantum size regime. Examples of a series of alkylzinc phosphinates with the general formula [RZn(O2PR′2)] (R=tBu or Et) have been prepared through equimolar reactions between ZnR2 and a selected phosphinic acid, namely dimethylphosphinic acid (dmpha-H), methylphenylphosphinic acid (mppha-H), diphenylphosphinic acid (dppha-H), or bis(4-methoxyphenyl)phosphinic acid (dmppha-H). The reactivities of alkylzinc phosphinate complexes toward H2O and O2 have also been investigated, which resulted in the isolation of two oxo-zinc phosphinate clusters, that is, [Zn4(μ4-O)(dppha)6] and [Zn4(μ4-O)(dmppha)6], as well as the unique alkoxy(oxo)zinc cluster [Zn4(μ4-O)(μ2-OtBu)(dppha)5]. Analysis of the crystal structures has revealed that organozinc complexes incorporating phosphinate ligands exhibit a unique capacity for shape-driven self-assembly to produce extended networks, including noncovalent quasi-porous materials. Finally, monodispersed and quantum-sized ZnO NCs coated with phosphinate ligands have been prepared using a non-external-surfactant-assisted wet-chemical organometallic approach based on well-defined [RZn(O2PR′2)]-type compounds. The resulting brightly luminescent ZnO NCs exhibit average core sizes and hydrodynamic diameters in the ranges 2–4.5 nm and 5–8 nm, respectively. The size of the inorganic core is slightly affected by the character of the incorporated phosphinate ligand, being smallest for ZnO NCs coated by asymmetrically substituted mppha ligands. Regardless of whether or not various phosphinate coating ligands could be controllably applied on the ZnO NC surface, no significant differences were found in the luminescence profiles of the analyzed nanosystems.